How yoga, aromatherapy, teas, and more can help you get and stay well. Stress. Fatigue. Depression. Sleeping problems. Issues with focus and concentration. Headaches. Substance abuse. These are all common problems that teenagers deal with. We have long been acquainted with the conventional treatments of therapy and prescription medications. It turns out there are also many complementary and alternative therapies available that have evidence-based track records of success. 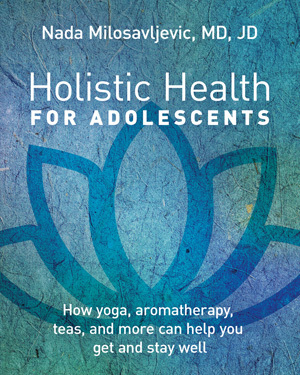 This book presents therapies based around the five senses—including acupressure, aromatherapy, yoga, sound/music therapy—to help teens with their mental health. Each chapter reviews the signs and symptoms of a problem and presents detailed treatment protocols and therapies. This all-inclusive book is one-stop shopping for teens and parents looking for new, synergistic, and different ways to handle life’s problems. As both a trained medical doctor on the faculty at Harvard Medical School and a noted complementary and alternative medicine specialist, Nada Milosavljevic brings a rich background of experience to this book. “An invaluable guide for today’s teens and their parents by an innovative, and dare-I-say-utterly brilliant doctor at Harvard Medical School. Using her unique experience as a medical doctor, researcher, and founder of the Integrative Health Program at the worldleading Massachusetts General Hospital, Dr. Nada Milosavljevic leads the way into this important field—providing treatment plans that are easy to understand and fun to use. Dr. Milosavljevic’s plans, using alternative therapies with evidence-based track records to back them up, provide much-needed alternative options to simply doling out prescriptions or sending kids to therapy. Her innovative simple-to-follow treatment plans provide exciting, proven solutions for teens dealing with challenges such as stress, fatigue, depression, sleeping problems, issues with focus and concentration, headaches, and even substance abuse. 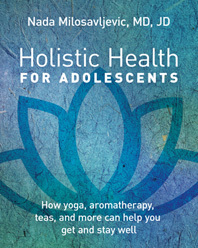 Thoughtful, well-researched, and encouraging, Holistic Health for Adolescents will surely serve as both an illuminating and comforting roadmap for many families as they navigate more issues and challenges than any prior generation. Dr. Milosavljevic is uniquely qualified to offer these tools and innumerable families will benefit greatly from her work.” — Sara DiVello, nationally noted yoga teacher and best-selling author, Where in the OM Am I?